Air purifiers, like my toaster, are "insidious"
I actually have seasonal allergies that trigger asthma and I know several people who've recommended I try one of these ionic air purifiers. Sure they look harmless, but apparently, I'd be just as well off sucking from a hose attached to a car exhaust. 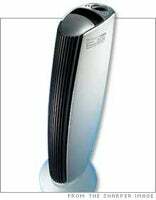 It seems that these so called air "purifiers" actually generate enormous amounts of ozone as a byproduct of their amazing, ionizing powers. A study funded in part by the National Science Foundation found that in poorly ventilated rooms, the ozone can reach levels associated with a Stage 2 Smog Alert, actually making asthma worse . "These machines are insidious," said Barbara Riordan, acting chairperson of the California Air Resources Board (ARB), in a warning last year. "Marketed as a strong defense against indoor air pollution, they emit ozone, the same chemical that the ARB and … U.S. Environmental Protection Agency have been trying to eliminate from our air for decades. More chilling is that some people susceptible to the ill effects of ozone will eagerly bring these Trojan horses home."